There is no doubt that Leoš Jánaĉek’s “Jenůfa” is a great and accessible 20th century masterpiece. This accessibility is surprising, given that “Jenůfa” has few of the trappings of the most popular grand operas: there are no tuneful arias, no rousing marches, no easy to remember melodies. The score is irresistibly musical, yet gives an uncanny impression of speech rather than singing. It has an extraordinary unity — it does not seem so much like a collection of set pieces as an integrated whole — each act as tightly knit as a single song. SF Opera’s production approaches perfection. Serious opera, generally, is a dicey proposition: there is so much that can go wrong! But when the orchestra, the singers, the acting, and the staging combine to produce great art, opera hits an aesthetic sweet spot to be found nowhere else. “Jenůfa” achieves that level of magnificence; it is superlative. (Karita Mttila). Photo Credit: Cory Weaver. Jánaĉek’s musicality is wonderfully articulated by the SF Opera orchestra, led with brilliant, subtle assurance by conductor Jiři Bĕlohlávek, the music director of the Czech Philharmonic, and a Janacek specialist. Every subtlety, every nuance, is polished. The singers are never overpowered and the sinews of the music are never unclear. Nothing is muddy, nothing confuses, one can completely give oneself over with confidence that all will be understood. Jánaĉek’s mastery of characterization is Shakespearean. Minor characters, such as the mayor’s wife, or a young village girl who organizes a performance for a wedding celebration, are fully developed. Major characters have the depth achieved in the greatest dramas. Malin Byström makes her SF Opera debut as Jenůfa, the first time she is playing this role. She has previously performed in many leading opera houses, including the Metropolitan, and it is easy to see why. Her glorious performance of one of the opera’s most famous passages, a prayer sung by Jenůfa when she learns that her infant is missing, is devastatingly beautiful. On the night I attended, the audience responded with respectful silence, too moved to burst into applause at its end, but absolutely attentive and transported. In the role of Jenůfa’s mother Kostelnicka Buryjovka, Karita Mattila sings with extraordinary authority, but is just as impressive in acting a difficult part in which the character is driven to commit a crime of unspeakable horror while still remaining profoundly sympathetic. Born in 1960, Mattila seems now to be at the very peak of her dramatic powers, and her debut performance in this role is likely to become legendary. She will be repeating the part at the Metropolitan Opera this Fall, and San Francisco no doubt will be bragging for years to come that we heard her first. The audiences at the Met will surely be dazzled. Watch for that. The men are by no means outclassed. As the drunken, disreputable Števa Buryja, tenor Scott Quinn is strikingly charismatic, and sings beautifully. Quinn is making his San Francisco debut in this part, and there is little doubt that his star will continue to rise. In the more sympathetic role of Laca Klemeň, William Burden also shines. The remainder of the cast are superb in a variety of well developed smaller roles. Each of the minor characters in this production are beautifully sung, and completely convincing psychologically. Several of these parts are played by Adler Fellows, some making their debuts, and they are outstanding: Julie Adams, Toni Marie Palmertree, Anthony Reed, Matthew Stump, and Zanda Švēde. One of the most notable successes of this outstanding production is the achievement of a true acting ensemble among the entire company, something rarely achieved at the opera. At the performance I attended, the quality of riveted attention among the audience members was another striking aspect of the experience — the tension was maintained with such unerring control by singers and orchestra, that for each act, all applause was held until the blackout. Even then, a truly boisterous response was saved until the final curtain when the audience let loose with cheers and cries of “bravo” and “brava” that lasted much longer than the average ovation. And rightly so. Guardian critic Charlotte Higgins once wondered in a review if Jenůfa might not be the perfect opera. Whether it is or not, San Francisco Opera’s current production makes as good a case for that assessment as could possibly be imagined. “Jenůfa” plays at the War Memorial Opera House through July 1, 2016. For further information, click here. “Jenůfa,” music and libretto by Leoš Janáček, based on a play by Gabriela Preissová. A production of Hamburg State Opera. Conductor: Jiří Bĕlohlavek. Director: Olivier Tambosi. Production Designer: Frank Philipp Schlössmann. Lighting Designer: Gary Marder. Chorus Director: Ian Robertson. Dance Master: Lawrence Pech. Fight Director: Dave Maier. Costume Supervisor: Kristi Johnson. Grandmother Buryjovka: Jill Grove. Jenůfa: Malin Byström. Laca Klemeň: William Burden. Jano: Sarah Tucker. Foreman at the mill: Matthew Stump. Kostelnička Buryjovka: Karita Mattila. Števa Buryja: Scott Quinn. Barena: Toni Marie Palmertree. The maid: Laura Krumm. The mayor of the village: Anthony Reed. The mayor’s wife: Zenda Švede. Korolka: Julie Adams. A woman’s voice: Angela Moser. A man’s voice: Torlef Borsting. Kostelnička’s aunt: Buffy Baggott. 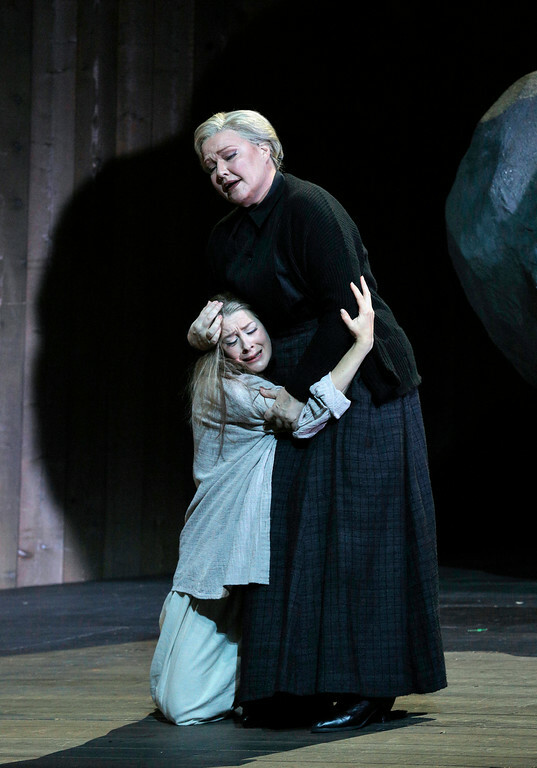 Posted in Reviews.Tagged Charles Kruger, Jenufa, Jiri Belohlavek, Karita Mattila, Leos Janacek, Malin Bystrom, San Francisco bay area opera reviews, San Francisco bay area theater reviews, Scott Quinn, theatrestorm, William Biurden.